For bulk orders of over 2,000 6 Panel Cups, PLEASE call 888-936-6627 or 561-409-5151 for even better pricing. Our 6 Panel 25 cups Drug Test is a CLIA waived and FDA approved POC (Point-of-Care) urinalysis cup. It is designed to be both affordable and entrusted by companies, institutes, schools and more. The 6-panel drug test cups has a round design with a no-drip screw top lid, an easy to peel-and-read label, and is leak resistant. 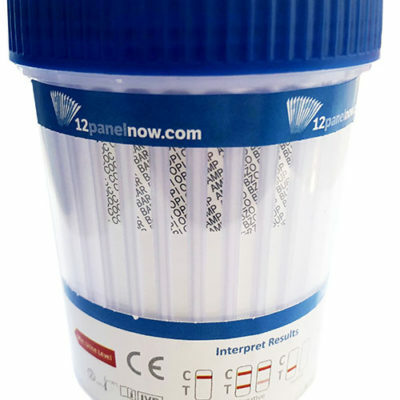 Each cup of 6 panel 25 cups also contains a built-in temperature strip that is used to authenticate the donor’s urine. The cup is extremely sensitive and affiliates to SAMHSA cutoff levels. New lower cut-offs make this the ideal urine analysis test for pain management and addiction screening. Each drug testing cup possesses a 99% accurate and authenticate rate and is also very comprehensive to use for at home or workplace drug testing – it’s a fully integrated and self contained screening cup. Results of the 6 Panel 25 cup Drug Test can be perceived in as little as two minutes or less, although it is recommended that you assess the urine specimen five minutes after the drug test has been taken. Do not wait longer than eight minutes to interpret the result. Simultaneously, the drug screening cups should be stored in a temperature regulated room between 36 degrees and 78 degrees Fahrenheit. Do not remove the seals of drug test cups until they’re ready for use. Bring the certified and easy to use 6 Panel 25 cups Drug Test, specimen, and/ or controls to room temperature. (59-78 degrees F) Make sure to store at refrigerated temperatures before using them. Remove the cup from sealed pouch and use it as soon as possible. The operator checks the cap for tightness. 8. Positive test results must be confirmed by another or alternative drug testing method. Send the cup and urine specimen intact to a toxicology laboratory for confirmation.